Connected Logistics provides various benefits to logistics businesses offering services for varied industry verticals by providing real-time access, improved operational efficiency, and enhanced productivity through integration of multiple connected platforms. Connected Logistics service providers have introduced innovative products and solutions to enable ease of access and high level of interoperability to achieve high productivity and informed decision making through collective efforts. Moreover, there are various communication technologies that facilitate improved logistical support, these include Bluetooth, ZigBee, Wi-Fi, and others. The NFC segment is anticipated to witness the highest growth rate during the forecast period. 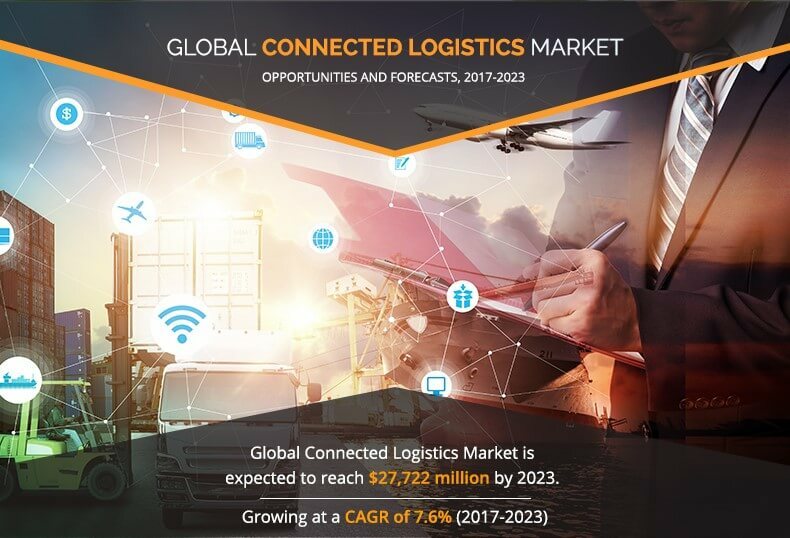 The global Connected Logistics market was valued at $16,774 million in 2016, and is projected to reach at $27,722 million by 2023, growing at a CAGR of 7.60% from 2017 to 2023. The increase in need for mobility, need to reduce cost of administrative processes, penetration of IoT & Logistics 4.0, and the increased market for connected devices supplements the market growth. Connected Logistics facilitate logistical businesses with real-time updates, interoperability, and easier access to required information. It provides interface to integrate multiple devices, which enables informed decision making. The increased market for intelligent transportation solutions is expected to drive the Connected Logistics market growth. The global Connected Logistics Market is segmented based on technology, device, and region. The technology covered in the study includes Bluetooth, Cellular, Wi-Fi, ZigBee, NFC, and Satellite. Varied devices covered in the report are Gateways, RFID Tags, and Sensor Nodes. Based on region, the Connected Logistics market is analyzed across North America (U.S., Mexico, and Canada), Europe (UK, Germany, France, and rest of Europe), Asia-Pacific (China, India, Japan, and rest of Asia-Pacific), and LAMEA (Latin America, Middle East, and Africa). The global Connected Logistics market is influenced by several factors that include increased penetration of IoT & logistics 4.0, increased application areas, increased market for cloud solutions and proliferation of connected devices, growth associated with end-use industries, demand from developing economies, and others. All these factors collectively provide opportunities for Connected Logistics market growth. The growth in sales of mobile phones has increased the adoption of Connected Logistics among end users. According to “Ericsson Mobility Report” published in 2015, the number of smartphone users is expected to reach 6.1 billion by 2020. Further, Cisco IBSG have predicted that the number of connected devices is expected to reach 50 billion by 2020. 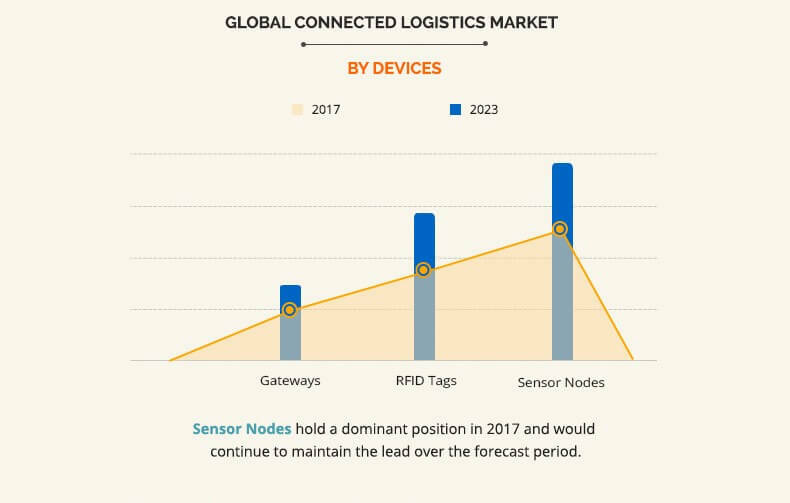 In addition, introduction of Bluetooth 5, Bluetooth beacons, growing internet penetration, and expected rise in trade volumes during forecast period are some of the factors that are expected to fuel the Connected Logistics market demand. Further, enterprise from all industry verticals is expected to drive the demand for Connected another analysis from Cisco states that India is expected to have around 650 million smartphones by 2019. Rise in adoption of cloud-based technology along with usage of logistics 4.0, Bluetooth 5, and IoT drives the growth of the Connected Logistics market. At present, cloud technology is adopted widely amongst all the businesses, which provide logistical businesses affordable solutions., the implementation of cloud enables organizations to combine supplementary Cloud computing allows the model to function from anywhere and anytime. Hence, the rise in the adoption of the cloud-based solutions drives the growth of the Connected Logistics market. Increase in demand for advanced solutions and technological advancements in the logistics industry, presence of untapped demands, and surge in need for better infrastructure in the countries such as China, Japan, and Australia provide enormous opportunities for the market growth. The report provides an overview of the trends, structure, drivers, challenges, and opportunities in the global Connected Logistics market. The global connected logistics market is estimated to witness significant growth in Asia-Pacific and LAMEA, owing to high investment in IT, increased adoption of Logistics 4.0, growth associated with Big Data and Analytics & IoT market, and rise in demand for advanced Bluetooth solutions. The connected logistics market share is projected to grow at a CAGR of 7.60% from 2017 to 2023, owing to increase in demand for application-specific solutions in the developed and the developing regions. Connected logistics is increasingly deployed in North America, followed by Europe, Asia-Pacific, and LAMEA. North America showed the highest market share in 2016 due to increase in penetration of Wi-Fi, enhanced internet infrastructure, government initiatives for smart cities, and rise in number of developmental strategies followed by market leaders for business expansion. The connected logistics market is impacted by the need to improve the overall accessibility & interoperability of the logistics business processes. However, implementation issues limit the connected logistics market growth. The key players in connected logistics market are involved in the merger, acquisitions, and introduction of new features & capabilities to enhance their existing product portfolio. This is anticipated to increase the product penetration and enable key providers to establish themselves in the emerging markets. For example, in May 2017, Honeywell International Inc. introduced Connected Freight Solution for effective management of goods in transit.